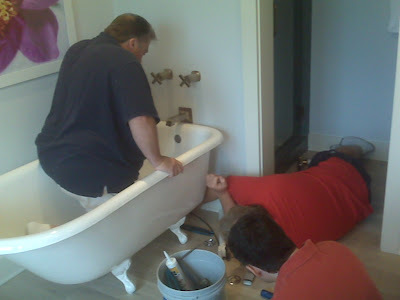 In construction there are ALWAYS different hiccups, but we like to surround ourselves with a teams of problem-solvers! Mark Riling and his amazing team, William and Eric of East Coast Plumbing and Gas, showed up bright and early with an idea and a solution to our challenge. Relentless to help us achieve a our standard of excellence along with their standard, we found 3 grown men in a tub, well, not really, that’s a mental picture we can definitely do without!